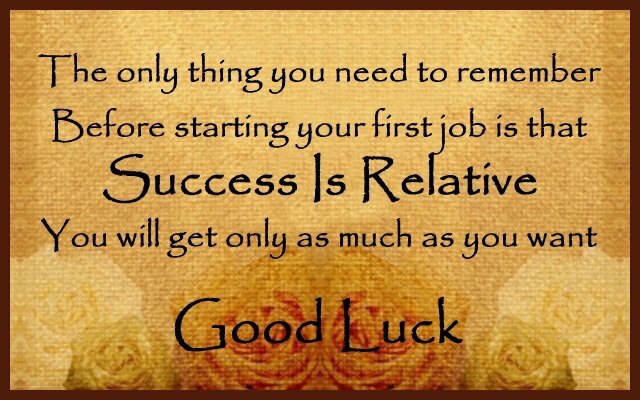 Good luck messages for first job: A first job is the beginning of many things to come including new colleagues, new bosses, new car, new home, new relationships and countless new experiences. Undeniably, a first job is not only the beginning of people’s careers, but also a foundation of the rest of their lives. This post is a wonderful mix of motivational quotes, heartfelt wishes and funny messages. Read them and be inspired to write something inspirational on a greeting card to send your best wishes and congratulations to someone who just landed the very first job of their life. Whether it is for a friend, son, daughter, brother, sister or your college roommate – write a touching note that serves as a mental anchor and helps them shine out like the superstars they are. 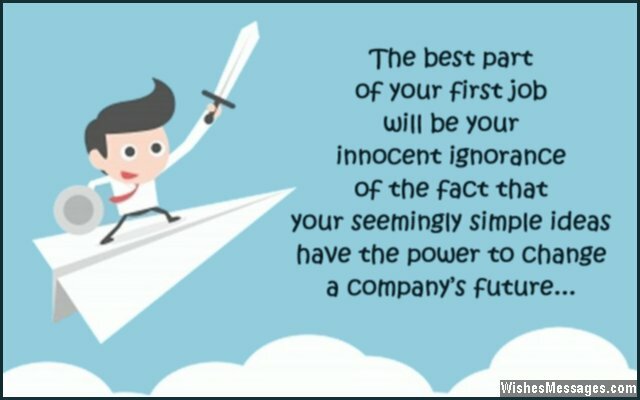 1) The best part of your first job will be your innocent ignorance of the fact that your seemingly simple ideas have the power to change a company’s future. Good luck. 2) A word of advice as you start your first job – a job is only as good as the person doing it. Good luck. 3) May you be your boss’ pet, colleague’s best mate and the life of after work parties. Good luck for your first job. 4) The only difference between a new recruit and an intern is that one is paid to get bullied and the other is not. Good luck for you very first job. 5) First job advice – never underestimate the value of a helpful colleague and never overestimate the value of an arrogant boss. A helpful colleague will Stand By Your Side when things go wrong while an arrogant boss will simply Brush You To The Side. Good luck. 6) Your company is lucky to have you as their new hire, for you are the kind of employee that every organization would desire. Good luck. 7) First jobs are like first girlfriends and boyfriends – you can hate them but never forget them. Good luck. 8) Right now, your first job will seem like your life’s biggest challenge. But decades down the line, it will become one of your life’s most innocent and precious memories. Good luck. 9) Coffee runs, photocopying and filing paperwork – these are some of the unofficial tasks of your job description as a new recruit. Good luck and have fun. 10) The hardest worker is not necessarily the smartest one. The smartest worker is not necessarily the hardest one. So play it safe by working hard and working smart at the same time. Good luck for your first job. 11) Only star students like you get picked straight from college classrooms into company boardrooms. Good luck. 12) No matter where you go, no matter what you become, the experience of your first job will be a memory so beautiful and awesome. Good luck. 13) Your biggest asset is not your college degree, it is your enthusiasm. Use it in abundance. Good luck. 14) You banked on your degrees to get your foot in the door. Now it is all up to you. Good luck. 15) Let your enthusiasm negate and overpower any kind of pessimism that you may face in your first job. Good luck. 16) Your first job will be like your first love – adventurous and magical yet sometimes frustrating, but priceless in hindsight. Good luck. 17) First job, first cubicle, first colleague, first team, first boss, first monthly review, first performance appraisal, first promotion… phew, you have so many firsts to look forward to. Good luck. 18) May your first job show you a glimpse of the outstanding career path you are about to carve for yourself. Good luck. 19) A first job is a level playing field in everyone’s life. It is in your hands to make the most of it. Good luck. 20) I know that you are prepared to be a part of an amazing company. I wonder if your company is prepared to handle an amazing employee like you. Good luck for your first job. 21) Every party that you missed and every holiday that you did not take with your friends for studying hard in college has finally paid off. Good luck for your first big role. 22) Bagging your first job is just one of the many accomplishments you are about to achieve in your professional life. I hope you will soon start bagging promotions, better perks and higher pay. Good luck. 23) Don’t be afraid to take decisions and never be afraid to fail – this should be your motto as you start your first job… because you really have nothing to lose. Good luck. 24) The first advice I will give you for your first job is to inculcate the discipline to be the first one to reach office every day. Success will follow. Good luck. 25) The joy of your first promotion or the joy of switching to a better job – none of these will match up to the priceless joy of earning your first paycheck. Good luck and congratulations for your first job. 26) Anyone can get good academic records and recommendations from professors. But not everyone can get your smartness and confidence. Good luck in your first job. 27) Give your unique skills and talents the freedom to bloom uninterruptedly so that you can add value to your company’s performance organically. Good luck for your first job. 28) Your first job is the first rung of the ladder which will lead you to success in your professional life. Good luck for taking the first step. 29) Always remember that your employers haven’t done you a favor by giving you this job. You are so good that they had no other option. Good luck for your first job. 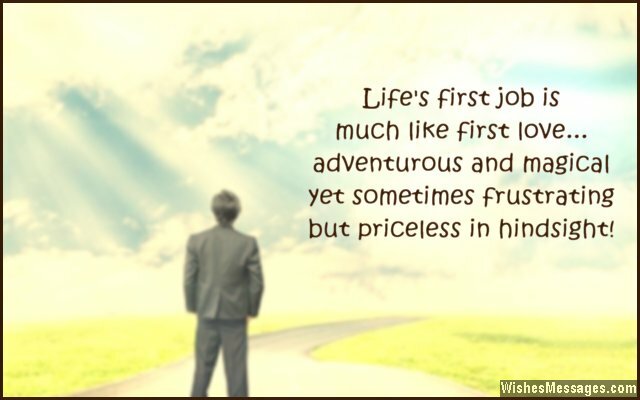 30) Life’s real test was not the one that got you a degree, but the one that will begin with your first job. Congratulations and good luck. 31) The only thing you need to remember before starting your first job is that success is relative – you will get it only as much as you want it. Good luck. 32) Your first job doesn’t just mark the beginnings of your professional life, but new innings of your personal life too. Good luck. 33) May your first job be awesome and may it set the tone for the rest of your career. Good luck. 34) Although you are fresh out of college, you also have well rounded knowledge which I hope your new boss will acknowledge. Good luck with your first job. 35) Sales figures will skyrocket and losses will plummet, now that your company has access to your amazing intellect. Good luck. 36) Your inexperience is not a liability, it is dead stock waiting to be converted into a revenue generating asset. Good luck for your first job. 37) Your first job is the starting line of the marathon of your career. Make a good start but don’t hurry, else you will run out of steam before the finish. Good luck. 38) All your life you have learnt what your teachers wanted to teach you. Your first job is your chance to learn the skills that you want to. Good luck. 39) Now that you got your first job, you will finally be able to put up something meaningful on your LinkedIn profile. Good luck. 40) All the mistakes you have made in your life so far are now a thing of the past. Your first job is a new beginning and a fresh start. It is your opportunity to put your life in the direction that you want to… make the most of it. Good luck.